Richard Taylor is director of the Center for Real Estate at Suffolk University’s Sawyer Business School. He has worked in the greater Boston area for most of his life, developing projects such as Boston’s World Trade Center, the rail service from Worcester to Boston and the Big Dig. Because of his long career in real estate he looks at life through a particular historical lens. His new book, Martha’s Vineyard: Race, Property, and the Power of Place, traces the story of the African American community on the Vineyard, which in the 1890s was one of the few vacation destinations in the country that allowed black families to purchase property. Mr. Taylor focuses on the families of Luella Coleman, Dorothy West, Harry Burleigh, Edward Brooke and Adam Clayton Powell Jr., among others. Mr. Taylor argues that the power of a people is enhanced by centralization around a place, and that communities are better established if they are in that place permanently. The book is divided into chapters based on African American families who have had an impact on the Island from the late 19th century until today. The book opens by describing the situation for many families on the mainland. The Bruce family bought a house in California in 1912, and in the 1920s the city used the power of eminent domain to take the house. A similar situation happened to Malcolm X’s family, the Littles. The Vineyard, however, was one of the few places that African Americans could buy vacation property. Consequently, it became a center for some of the most prominent families, including the families of Dorothy West and Adam Clayton Powell Jr. Ms. West was a writer and member of the Harlem Renaissance movement who worked with Richard Wright, Langston Hughes and Zora Neale Hurston. But Mr. Taylor believes her work on the Vineyard left the greatest impact. 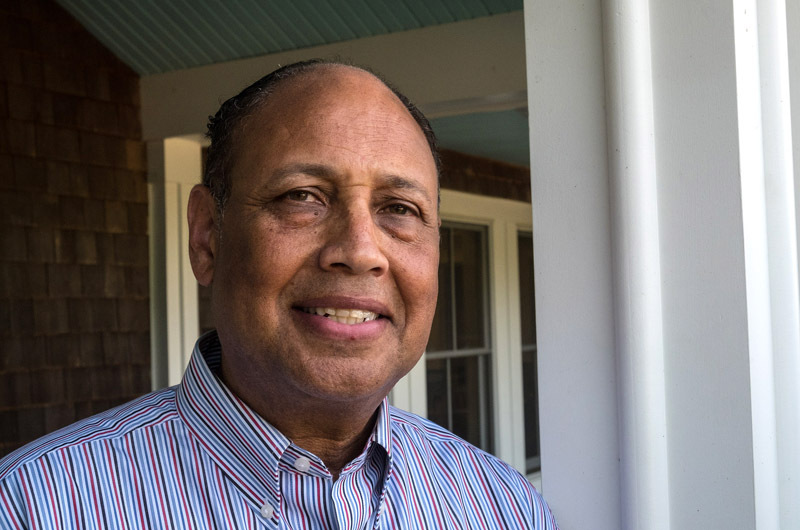 “To me, however, the most significant thing she was able to do, was write the column for the Vineyard Gazette about the African American community on Oak Bluffs, which started in 1968,” he said. Mr. Powell went on to represent Harlem in the U.S. House of Representatives and was re-elected for nearly 30 years. In 1961, he became chairman of the education and labor committee, and supported passages of civil rights legislation under Presidents Kennedy and Johnson. Mr. Taylor also discusses the legacy of Sen. Edward Brooke 3rd, who died last year and spent summers on the Island. He was the first African American elected to the Senate since Reconstruction, sworn into office in 1966, at the height of civil rights activism. The book concludes with a chapter entitled The Age of Obama. The author notes that since 2008, the civil rights movements on the Island have taken on national proportions. Examples include the African American Film Festival and the Smithsonian National Museum of African American History and Culture, which will open in September and features Oak Bluffs in an exhibit titled The Power of Place. Mr. Taylor said events on the Island are a segue to the politics of the country. I'm anxious to read this. I have enjoyed "African Americans on Martha's Vinyard "by Robert and Karen Hayden and "Finding Martha's Vinyard " by Jill Nelson. Great reads,also. For generations, African Americans from all walks of life, celebrities, political leaders, successful business folks, esteemed scholars and scores of others have chosen Martha’s Vineyard as their preferred vacation destination and to buy summer homes. What is the allure of this small Island community for African Americans. Well, in his wonderful, insightful and thought provoking book, Taylor answers this question. My gals group chose to forego our usual Caribbean spots one summer and stayed on the Vineyard instead @ Oak Bluffs. Loved the history (the Inkwell) and the laid back vibe.Can't wait to return (after I read the book). Brother Taylor looking forward to reading your book. Much success. This is the unusual story of the unlikely relationship between two families. On Sunday Grace Church became the 28th site on the African American Heritage Trail.